Description: Fun fast-paced solitaire that will make your mouse click and your brain crack. Build the eight foundations from the 104 cards, mixed up in seven piles and one more. Two decks, 104 cards, and YOU. This is going to be something! 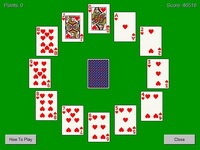 Instructions: Build the eight foundations in suit from aces and up, in as few moves as possible or as fast as you can. Press 'i' for instructions while playing.